Massé / noun Billiards: a stroke made by hitting the cue ball with the cue held almost or quite perpendicular to the table. times New Zealand was represented overseas by a MassÉ member. 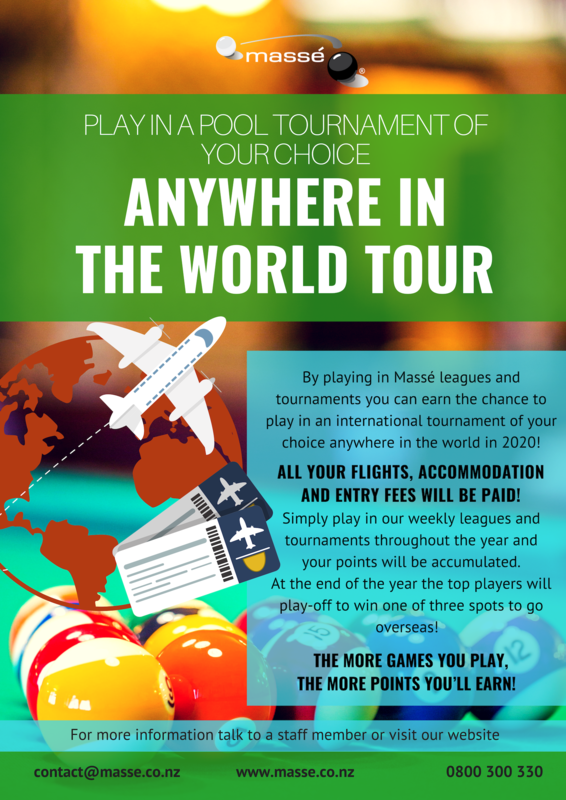 Join the OB 10 Ball Tour this year! 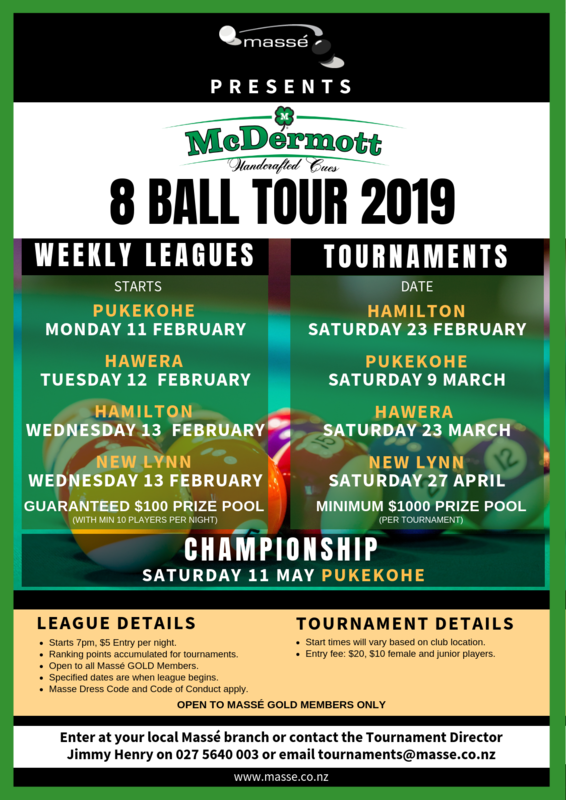 Takes place at Massé Pukekohe, Hamilton, New Lynn and Hawera branches at 7pm from 3rd September 2018. This is an opportunity to learn a new and fun sport! Never played pool before? No worries, you will get coaching along with the inter-school competitions! 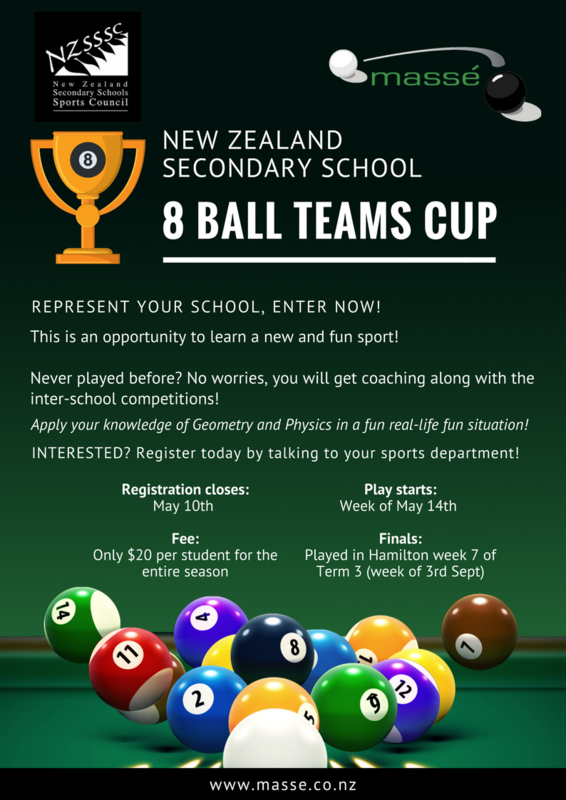 If you want to play in this competition or know of a student that would be keen, contact your school Sports Coordinator or email logan@masse.co.nz. All of your FLIGHTS, ACCOMMODATION AND ENTRY FEES WILL BE PAID! Click to find out more! 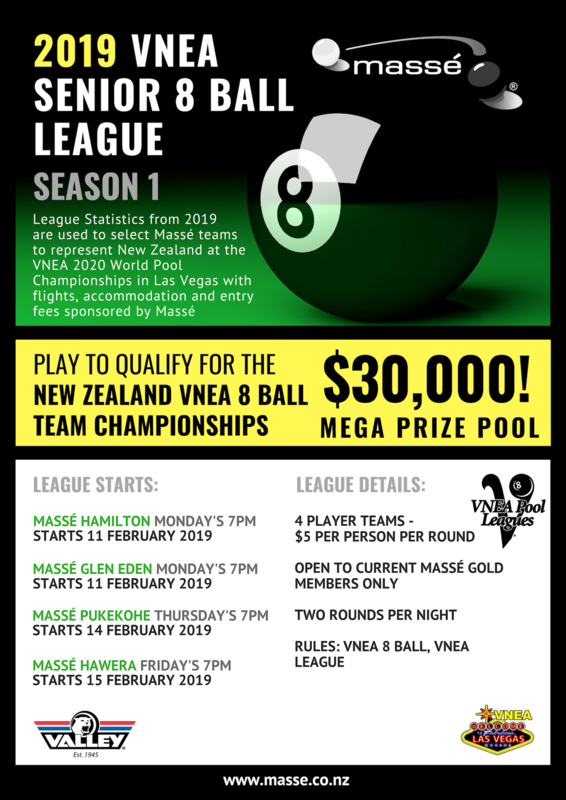 Play to qualify for the New Zealand VNEA 8 Ball Team Championships which has a MEGA PRIZE POOL OF $30,000, with a whopping $10,000 to the winning team!! 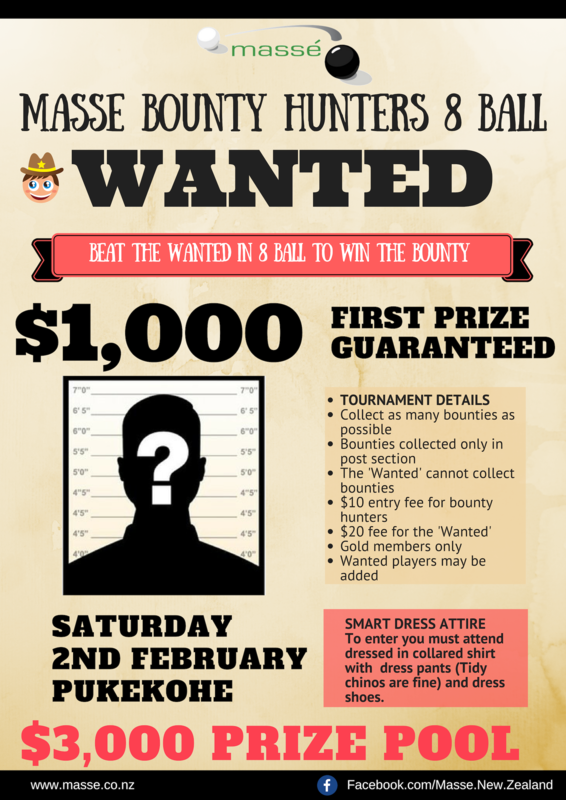 Come along to the 2019 Massé Bounty Hunter 8 Ball Tournament that takes place at Massé Pukekohe! 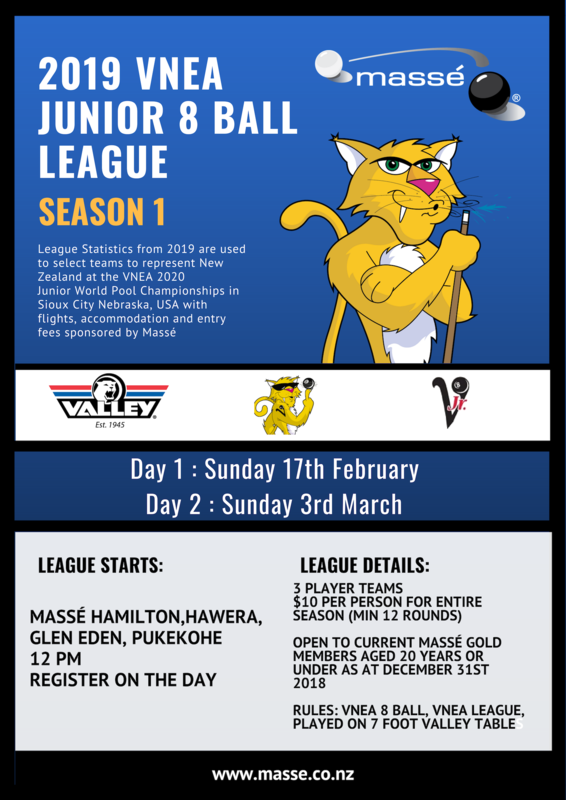 Massé Incorporated was founded February 11, 1991 and was originally called the Waikato Snooker and 8 Ball Club. With the Club’s expansion beyond the Waikato region it made sense to change the Club’s name to one that focused more on what we’re about, hence the name Massé.